Electricity networks of any size are complex systems, with all the advantages and disadvantages that this implies. The uninitiated believe that the principal threat to such systems is the failure of electricity producers, the generators, to meet the demands of consumers for energy, resulting in a blackout. This is not completely mistaken, but, in fact, blackouts on a modern and developed electricity system are only rarely directly caused by shortfalls of generation resulting from poor system planning, a power station accident, or an unexpectedly high consumer demand. System operators are nearly always able, even at short notice, to call on sufficient additional resources either to increase generation or reduce demand, though of course this remedial action comes at a considerable cost. A rather more probable cause of a system blackout is a transmission system equipment failure, at a transformer for example, or a sudden external event, such as a storm or a vehicle, a plane or a ship perhaps, damaging a transmission line. In a weak or poorly designed system such accidents will overload other transmission lines that then themselves have to shut down to avoid damage, sending a further ripple of overloading through a large part of the network, forcing generators themselves to come offline and resulting in a widespread blackout. Apart from ensuring a high specification for the components used and a high standard for design and construction, the best protection against such accidents is to ensure that the system is sufficiently stable under stress that it can contain the loss of supply to a small part of the network, this capability usually being automatic since action must be taken in milliseconds to prevent a cascade of faults. Accidents will happen, but a strong system can prevent a local problem from becoming a regional or even a nationwide disaster. The strength of the system must be continually monitored to ensure that it will be stable under stress, a precaution that would be necessary at any time, but has particular relevance in the UK at present due to the rapid and dramatic changes in the electricity supply industry being driven by climate change policy. It is therefore only prudent for National Grid ESO (the Electricity System Operator) to have initiated detailed work on an Operability Strategy with the aim of ensuring that its System Operability Framework is adequate to the task. The first tranche of documents was published in November and December 2018, and are available at the link above, with updates being provided in the regular Operational Forums, the most recent of which was held on the 26th of March (the presentations are all available via the link below). National Grid identifies five areas of concern, Frequency Control, Voltage Control, Restoration (i.e. recovery after a blackout), Stability, as discussed above, and Thermal (transmission line temperature). All are important, but to judge from the volume of commentary devoted to it, it is Stability that is giving most cause for concern. Specifically, Short Circuit Levels (SCL) in Great Britain are predicted to fall considerably over the next decade. The Short Circuit Level is the current that will flow through the system during a fault, an accident affecting a transmission line for example. It is, as National Grid explains, “a measure of strength”, and a “key parameter for protection systems” in the network itself and also in other equipment attached to it (National Grid, System Operability Framework: Impact of Declining Short Circuit Levels(December 2018), p. 1). There is a cheap simple remedy but the greens and climate change botherers in the climate change committee (Gummer and co) and all the civil servants of DECC would be dead against it. Simply do a reverse South Australia – blowup the bird mincers and build more HELE coal-fired power stations – problem solved, supply secured and costs of electricity drops. Ignore the subsidy farmers, they have made their money and then some. The problem of falling Short Circuit Levels is to ease the system load. 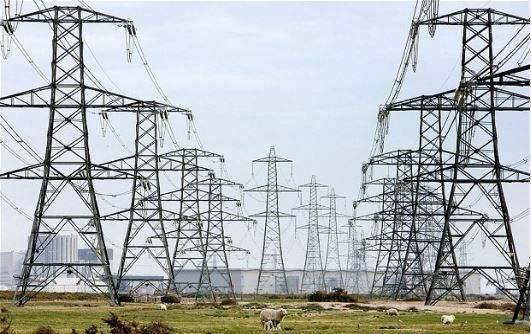 This is easily achieved by disconnecting all of London and the home counties from the grid as and when required (to meet satisfactory Short Circuit Levels). A ‘cart before the horse’ problem, I think. I can’t see any reference to the government having to take advice from the CCC on areas outside its scope and btw of national strategic importance, such as domestic power supply. Hence, IMHO the government should be able to decide for itself (if it so desired) whether to build new power stations, or curtail intermittent power or whatever to ensure reliable power. Then, and only then, should the CCC do its job on ‘advising the UK government …on emissions targets…reducing greenhouse gas emissions…’. Or have I misunderstood something? How much of this problem is due to EU dictats vs local climate warriors? So parliament should repeal the climate change act since it is the base on which all the stupidity is built. Under the Climate Change Act the CCC has specific statutory duties that include advising the Government on carbon targets and climate change risks. This statutory advice has generally been followed, albeit not always to the letter. …the Government runs a tangible risk of a judicial review if it does not follow the CCC’s policy advice more carefully. We have exactly the same problem in Eastern Australia. (West Australia isn’t part of the national grid.) Years of lunatic government interference, spending millions on megabatteries, politicians who haven’t a bloody clue about the problems they create via ignorance, and a media who are determined we will have the unicorn fart renewable system they want. The sale of home generators has been the only growth area in the Australian economy for years now as crippling power costs send our remaining industry to Asia.